Balboa Spa Pack VS501 Retrofit Kit. Replaces most Spa Pack System. Comes with VL200 LCD topside controller. OEM part reference 54220-z with Upgrades. Balboa VS501z 5.5-1.5 Kw Digital Spa Pack With Patented M7 technology - This is the world's best spa pack! Time to upgrade your old spa pack hot tub heater? Balboa VS501z , uses simply the best spa pack technology in the market. Completely digital circuitry means less failures, more accurate heating range, and much simpler to use. Accurate to +/- 1 degree with full top side LCD controllers , means, you will never have to leave the spas or tub to change the temperature. The Balboa Spas Pack works at either 120 VAC producing 1.5KW, or with a change of a jumper operates at 230 VAC producing 5.5 KW of heat. It fits any standard 2" or 1 1/2" plumbing making it ideal to upgrade almost any older mechanical spa pack. Replaces any Spa Pack from other manufactures! Don't be fooled , Balboa Spa Packs can replace any hot tub heater on the market including Gecko, Hot Springs, Len Gordon, Hydro Quip, LA Sas, Cal Spas, Coleman Spas, Beachcomber Spas, Artic Spas to name a few..... Built in programmable features such a cycle programming, sleep mode, economy mode and self diagnosis are just some of its features. Weather freeze ups are eliminated with the built in freeze protection system. It also has the ability to select how much current will be drawn allowing use of a 30 Amp breaker or 40 Amp, yet still deliver the full features. It has receptacles for the following. One 2-speed pump + one 1-speed pump or blower (not both)+ one circulation pump + one ozonator + one constant-on for Audio/Visual devices + one 12 volt light. All receptacles (except light) can be switched to supply 120 Volts or 230 Volts. VS501Z pack including Stainless Steel portable heater with 2 heater tail pieces. 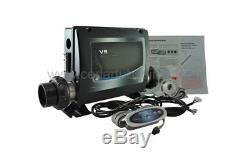 4 button mini-oval light duplex LCD digital control Panel VL200 with 7' cable. One 4-wire 2-speed pump cable with AMP plug. One 3-wire pump/blower cable with AMP plug. One 12 volt light wiring assembly with AMP plug. One loose 4-pin AMP plug with pins (to adapt a non-Balboa ozonator). Plasticized control instruction sheet; complete instruction manual for retrofit situations produced by Northern Lights. The Patented M7 Technology removes the need for pressure sensors and remote heat sensors common on other older spa packs. This unique technology allows the spa pack to be positioned in any location or direction (before, after the pump or before or after the filter). What is the difference between a regular VS501 and VS 501Z? Only the VS501(Z) is able to run either 220 VAC or 120 VAC accessories or a mixed combination! The latter & older models require accessories such as ozone to be the same voltage as the primary pump, limiting their applications. The VS501z is the most current model line from Balboa. The LCD digital topside control includes light function, high low pump, temp control, and blower. Functions may be changed to Temp Up, Temp Down, Jets, and Light. 10.56" High x 19.5" Long x 4.60 Deep. Comes with 12 V light that will support LED lighting. UL, CSA, and CE certification. 120 or 220 VAC ozone support. NOTE you can only use a 2nd single-speed pump or blower not both! If small circulating pump is being used the flow through heater must deliver 23 USGPM or more. MADE IN AMERICA not China. Measurements: W=4.3" (10.92cm) , H=1.6" (4.06cm). If you are looking for the best most reliable tub replacement system on the market, then Balboa VS501z with M7 technology it is. Their unsurpassed reliability is why Balboa is the world leader in Spa Pack manufacturing both in quality and reliability. 5.5 Kw Heater 220 VAC. Separate Optional Aux 5.5 Kw Heater. 240 VAC or 120 VAC. Separate voltage for ozone & blower. 1-Speed Blower or Pump 3. Light switchable to 12 volt or 120 VAC. Filter cycle program by time of day. Clean up cycle (filter & ozone on after use). Only when jets are on. IR Dolphin Remote Control Option (short range). RF Station Wireless Remote Control (long range). Wireless PC Remote Control via USB. Tech Support 1 800 by NLCT. Your #1 Hot Tub Parts Replacement Store! The item "Balboa VS501 Retrofit Kit Spa Heater with cables, light, VL200 LCD controller" is in sale since Thursday, February 18, 2016. This item is in the category "Home & Garden\Yard, Garden & Outdoor Living\Pools & Spas\Spas & Hot Tubs". The seller is "hot-tub-parts" and is located in Winnipeg, Manitoba.